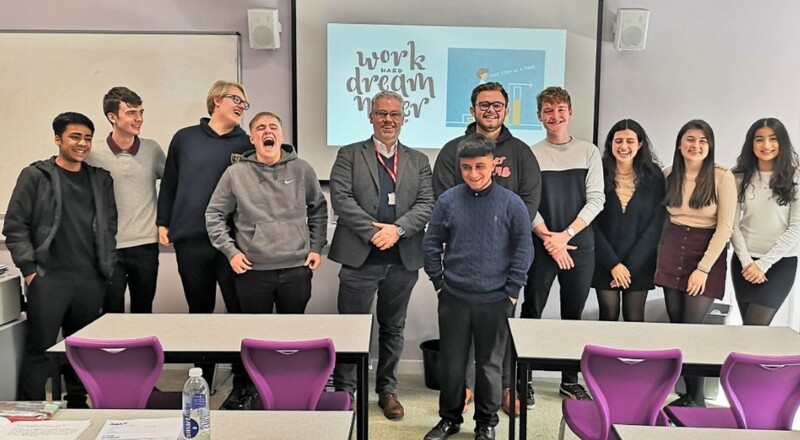 Above: Russell Horton, CEO of FluidOne speaking to Year 13 about business startups and offering insight into how to be successful in industry. Taking A-Level Business Studies is a great option for students who aspire to become self-employed or attain a managerial position. A-Level Business Studies offers students the tools and information required to understand how businesses are created, managed and become successful. Most of the material used in class and for assessment is based on real business situations. Students will gain a detailed understanding of how a business works, learning through an investigative and problem solving approach. Students will also learn to develop analytical and evaluation skills to understand the role of the entrepreneur and business in society. In the first year the course introduces students to the challenges and issues of starting a business, including financial planning, setting objectives and legal ownership. It then explores the key internal functions of business and how the management of these functions can assist in improving the effectiveness and performance of a business. The key units of the course are: Introducing Business, Financial Planning, Employees, Operations, Marketing and Management. In Year 13, students will progress to looking at larger businesses and how strategies are affected by the external environment. Topics covered later in the course are: the impact of technology, stakeholders and social responsibility for strategic decision making, difficulties in forecasting future trends and the importance of assessing feasibility and risk when making strategic decisions. The course will help to provide students with investigative and problem solving skills that can be applied to most areas of further education and employment. Subject specific career paths include law, banking, accountancy, finance, marketing, management, human resources and any area of business operations. Financial services is a leading industry in the UK and an A-Level in Business Studies will give students a strong foothold in this growing industry. Recent speakers: Sean Giltero from Autotrader spoke to Year 13 A level students about the importance of accounts. Rob Burton 13IN said “I found the talk interesting and relevant to my understanding of accounting ratios”. Examples of visits: Johnstons Sweepers.